My grandmother turned 90 recently and the family had a big party to celebrate. We are all about going big on a small budget so I decided to make — rather than buy — water bottle labels. They were fairly simple to make, just a bit time consuming. With a family party though, there are usually always people willing to help. Surprisingly my husband was into helping on this one! We started by removing the existing labels from the water bottles. Then I measured the width onto scrapbook paper in various patterns/colors that match the party theme. I cut the strips using my paper cutter. Next I typed and printed the circular tags. (I would have preferred to use circular white labels to print on, but I didn’t think about that in time.) I handcut/punched each circle — very tedious — but it didn’t take too much time once I got in the rhythm. I then glued the circle tags onto the paper strips, placing them in the center of each strip. 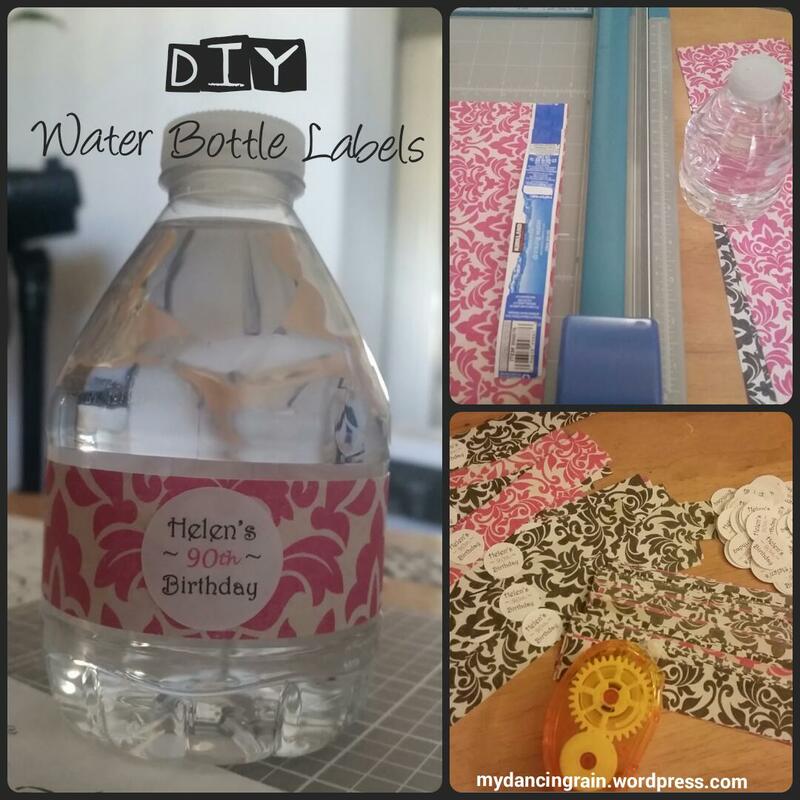 My husband helped affix the completed labels to the water bottles using a hot glue gun. With two people, this worked out well and cut down the time it would’ve taken for me to do it alone! He put the glue onto the bottle, starting the label on one end. Then he passed it to me to wrap the rest of the label around the bottle and make sure it was properly in place before the glue dried. The water bottles turned out nice and were a subtle touch for the party, showing that each detail was carefully considered in our decoations for such a special day. With this DIY method, we were not able to put the bottles in coolers due to the paper but no one complained!